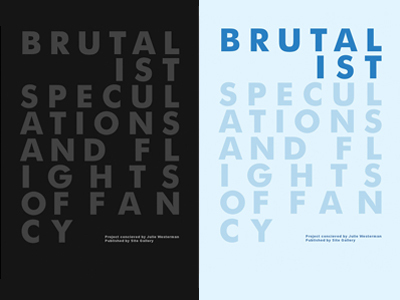 Brutalist Speculations and Flights of Fancy. The book contains the work of twenty-six artists and writers from Britain and Berlin who were invited to respond to six of Sheffields Brutalist buildings with speculations and flights of fancy. The publication is based on six buildings from the period of Brutalist architecture commissioned for Sheffield in the 60’s. Park Hill Flats, Castle Markets, Moor Street Substation, Holy Cross Church Gleedless Vallery, Norton Water Tower and the now demolished Psalter Lane Art School. The buildings cover a wide range of functions from the residential to the commercial to the utilitarian, some highly contests some almost ignored and one invisible. All artists and the writers are asked to respond with proposals and interventions for any of the buildings and asked to consider the position of these buildings today, part of a much loved landscape or irrelevant, robbed of their utopian ideals. Their uncompromising exteriors and utilitarian solutions leave them often exposed in a new architecture of facades. The publication encouraged a speculative approach to the solutions – budgets are without ceiling, building regulations hold no barriers. The project seeks to question a part of our urban landscape.